If you've played Pokémon Go and felt like there was something missing from the experience, you aren't alone. Some Pokémon in rural areas would be a fair answer, but the folks at GamerReality had a different thought. They think the game is missing an actual Pokéball that you actually throw. They've set out to fix that by developing a Pokéball that interacts with the mobile app in real time. They call it "The Trainer Ball" and it's pretty versatile for a device that is designed as a controller for just one game. The ball works when thrown in the direction of a Pokémon or it can be used as a gesture device when the user pretends to throw it (a bit like Wii bowling). The genius little device also functions as a portable charging station for your phone, since running the game is a total battery drain. GamerReality has developed a prototype, but they have significant challenges ahead before they can start production. However, funding doesn't appear to be one of those challenges. With 31 days remaining in their crowdfunding campaign, they have already raised far more than their initial $25,000 goal. The real challenge lies in licensing. For this product to actually exist in the marketplace, they'll need to complete a licensing agreement with Niantic Labs, something that is not currently in place. Not getting that in place would tank the project as presented. That makes funding their project a risky proposition. But the creators aren't hiding this. If the project is successfully funded (they've already passed the goal) and the license doesn't come through, they say they will refund funders less a 10 percent processing fee or funders can get the device when it's integrated into other not yet named games. It just wouldn't work with Pokémon Go. It's a gamble, but it's clearly worthwhile for many playing the game. It's a game built to get you out of the house and interacting with the real world. 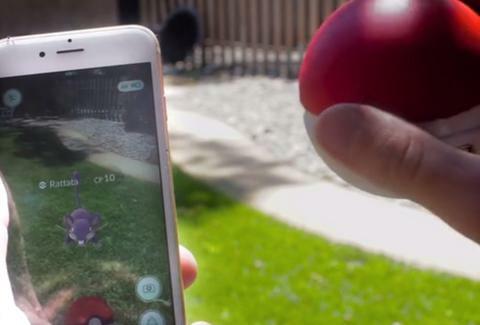 Having a physical ball to throw seems like a logical next step and may get people back into the game amid reports that the number of people playing Pokémon Go in the U.S. is plummeting.